This picture of crossed waveguides came from JB. It depicts a sorry situation that happens often in a microwave lab, especially in (but not limited to) setups by newer engineers. The flanges on many waveguides will allow you to connect them in a "cross-guided" fashion, resulting in a mysterious higher-than-expected loss (usually around 20 dB). The resulting horrendous VSWR plays havoc as well. If you click the picture you'll access a larger image, suitable for framing, we recommend you display it over the waveguide cabinet in your lab. Thanks, JB! Nice pocket protector! The ideal metal loss for rectangular waveguide boils down to some neat closed-form equations. For this calculation we used Pozar's book, which covers the subject. 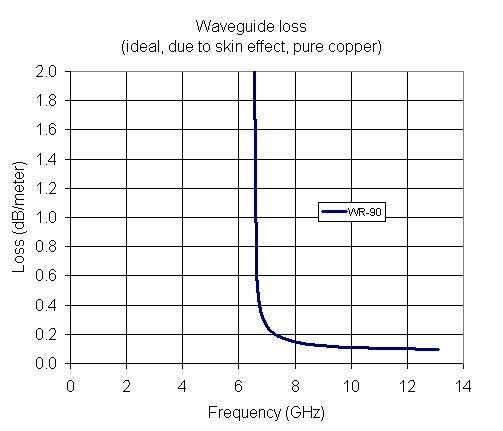 The first two things to calculate are the RF sheet resistance (function of the waveguide material's conductivity, permeability, and frequency). The loss goes to infinity at the lower cutoff frequency. 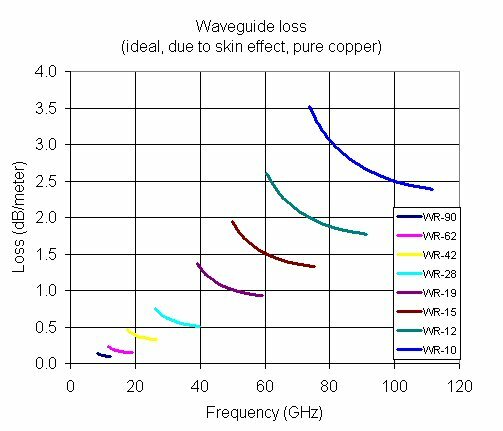 Here's a plot of the loss of WR-90 X-band waveguide. Note that it blows up at the lower cutoff frequency of 6.557 GHz. In practice, the generally accepted frequency band limits for rectangular waveguide are between 125% and 189% of the lower cutoff frequency, in this case 8.2 to 12.4 GHz. 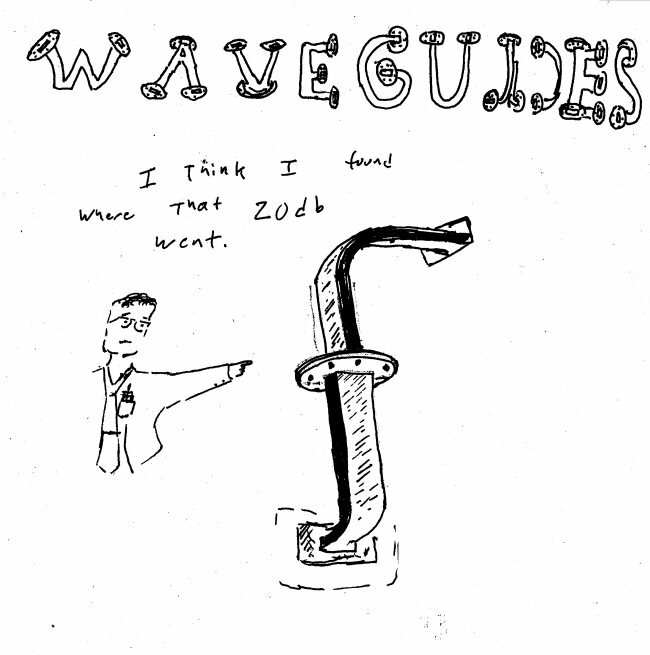 This is one of the coolest plots in microwave engineering, waveguide vendors have been known to make it into a poster which hangs in hundreds of laboratories around the world. We did this one in Excel, if anyone wants a copy of the spreadsheet, just click here. We've updated the spreadsheet for January 2015! Remember, this is for ideal copper waveguide. Expect to see "real" losses slightly higher. How about another Microwaves101 rule of thumb? Ordinarily waveguides are filled only with air, so the loss tangent loss is essentially zero. But once in a while you'll find a reaon to consider a dielectric-filled waveguide, then the properties of the dielectric must be considered. This topic is covered on a separate page.